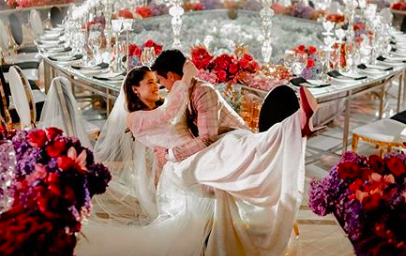 Showbiz couple Kylie Padilla and Aljur Abrenica tied the knot on Tuesday, December 11, in an intimate ceremony at Villa Milagros, Rizal. Less than seventy guests including the couple’s friends, family, and their one-year-old son, Alas, attended the ceremony. 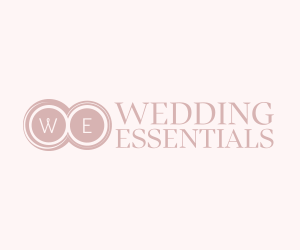 Weddings snaps shared on social media showed a keen attention to detail as the planning an execution took only two weeks according to the couple’s event planner – La Belle Fete Weddings & Events. The almost impossible task of transforming the wedding venue to a reception venue was completed in only one hour! The ethereal and dramatic theme continued with perhaps the most eye-catching element of the set: an aisle made from a reflective material that gave the illusion of flowing water with a poem inscribed in gold by American poet and writer Lang Leav, who according to Hermosa wrote it especially for the young couple. The North Wing hall of Villa Milagros was transformed by ace event stylist Gideon Hermosa into a rich and dark romantic garden which was seemingly inspired by Baz Luhrmann’s 1996 film, Romeo + Juliet. The venue was decorated in luxurious hues of red, black, white with touches of gold elevated by warm lighting from hundreds of candles, ornate candelabras, and bulbs from the five tall light arches in lieu of an altar. A profusion of floral arrangements from hundreds of roses to delicate baby’s breath added to the drama of the styling. The bride walked down the aisle resplendent in her custom lace Mak Tumang gown. The combined talents of Mark Qua and Renz Pangilinan, who did her hair and makeup further enhanced Kylie’s natural beauty. Videos shared on social media showed the bride making a dramatic entrance to Des’ree’s “I’m Kissing You” which incidentally is also one of the tracks from the film Romeo + Juliet. The groom, on the other hand, was clad in a tan plaid suit. The reception festivities continued with the bride changing into her second outfit, a black lace ensemble by Apartment 8 Clothing and vintage-inspired hair and makeup. Another eye-catching detail of the wedding was the couple’s one-of-a-kind cake by Chef Castillo Fuentes. According to the chef’s Instagram post, the colors used for the cake were red, black and gold to create a Spanish Baroque French Chinoiserie inspired confection. 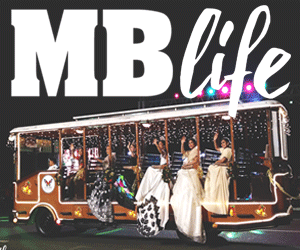 The couple and their team pulled off an Instagram-worthy event in no time. Their ethereal, moody and dramatic concept was exactly what they wanted. According to their event planner, the culmination of the elements they put together symbolizes the most beautiful things that emerge from darkness and adversities.